In-centre, whole team programmes are the most effective way to create common understandings in your team and to develop strategies together to implement improvements in practice. 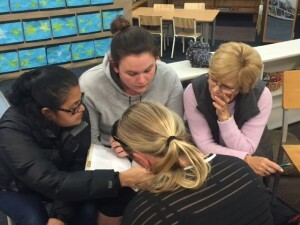 This means they are a very cost-effective form of professional learning as the team, supported by a facilitator, works together towards a strategic goal. We work with you to custom design a programme that will meet your team’s learning needs. A facilitator will work anywhere between 2-16 hours with your team on your identified area of focus. The approach is customised and may include the facilitator providing up to date content, leading whole-team discussions, working alongside teachers coaching practice, observing teacher practice and giving feedback and/or working with team leaders to strengthen practice. The focus identified by centres often comes from ERO recommendations, the strategic plan, internal evaluation findings or self-identified learning needs. All prices quoted for whole centre PLD are for centres within a radius of 35 km from central Auckland. This is an indicative list only, if you have an aspect of practice you are wanting to develop please let us know and we can design and cost a programme for you.